These poverty statistics are absolutely horrible! All we need is $60 billion per year to eradicate poverty in this world!! I encourage you to read the information below, pray, and share with others. Remember, 30,000 people die daily from man-made poverty(21,000 are CHILDREN)!!! Together, we can make a difference IF we obey and crucify our flesh! 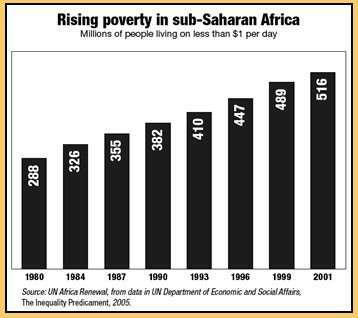 As you can see by the illustration to the right, just in sub-Saharan Africa, over a half-billion people live on less than $1 per day! There are a total of one billion people in the world that live on less than $1.25 per day. The problem is people are born into extreme poverty and a vicious cycle begins. A small minority of the world, like those in America and Europe, spend money on vain things, live in homes 4 times too large, drive in cars that are too new and take trips that feed their wicked flesh, all while every 3.9 seconds a precious child perishes because of their greed! Simply stated, they are godless. There is such a great need for children, and adults for that matter, to hear the Gospel and to get a sound, biblical education to break the chains of poverty. You can help by obeying Jesus and take care of the poor. 100,000,000 children are not currently being educated and 186,000,000 are bound in horrible child labor! 799,000,000 people in the world are illiterate. Help us break this horrible cycle of poverty by sponsoring a child today.